January is already here. And along with the new year are new rules from the USPS for Folded Self-Mailers (FSMs), which mail without envelopes. In the works for almost a year, these rule changes were designed to improve the automated processing of FSMs through Postal Service sorting equipment. Please keep in mind that if you have leftover cards that don’t follow the rules below, the post office will require additional postage to mail them. All the more reason to begin adopting these changes now! Acceptable sizes for FSMs are 4-1/4” x 6” up to 6-1/8” x 10-1/2”. CHANGE: Previously, the largest dimension was 11-1/2”. When looking at the mailing panel, all FSMs must open at the top and fold at the bottom. Check out the animation to see what this looks like – as well as how to orient the outside with the inside of your mailer. CHANGE: Previously, they could open either at the top or the bottom. 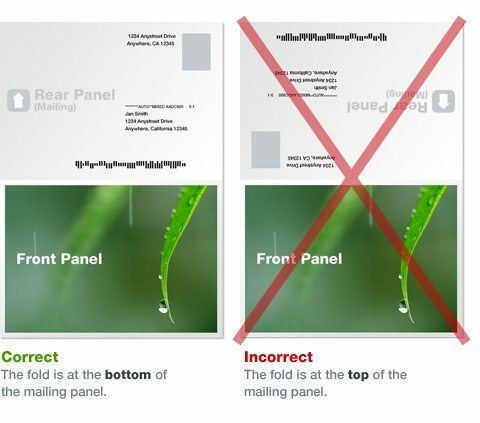 FSMs, such as Panoramic Products that fold on the right side of the mailing panel, are still allowed. However, they also cannot exceed 10-1/2” in length. FSMs must be sealed closed using glue spots or non-perforated wafer seals. CHANGE: Perforated clear plastic wafer seals can no longer be used. Translucent paper seals are required. Most importantly, the new rules apply to FSMs went into effect on January 5. So, whether you’re mailing them yourself or having us mail them for you, feel free to talk to your rep. They will help you choose the right options to avoid paying up to an extra $0.25 per piece.